For a Mechanicstown-area family with one or two children, a midsize sedan like the 2014 Honda Accord has long been the go-to pick. These days, more families are choosing compact crossovers such as the 2014 Honda CR-V that offer more versatile space. Both vehicles are in the same price range, but which one is the better choice for you? To help you make the final decision, our Middletown Honda dealer is going to compare the two models. What is Your Ideal Vehicle Size? Looking at the CR-V and Accord side by side, they look pretty different. The CR-V is a shorter vehicle than the Accord by a little more than a foot. On the other hand, it’s seven inches taller and gives drivers a more commanding view of the road. In terms of passenger space, both vehicles seat five and offer roughly the same maximum passenger volume. In the end, the choice in this category will come down to your stylistic preferences; the Accord is also available as a coupe, so that may be another factor in your decision. Where and How Do You Typically Drive? Both vehicles are well-suited for Mechanicstown families, but the 2014 Honda Accord might be the better choice for people who do a lot of driving or need a car that looks a little more professional. The 2014 Accord offers better fuel economy than the CR-V, with 2014 Accord LX models equipped with the CVT achieving a rating of 27 mpg city and 36 mpg highway. * If you like a lot of power from your vehicle, the Accord also gives you the option of a 3.5L V6 capable of 278 hp and 252 lb-ft of torque. The CR-V is going to be the better choice for very active families. 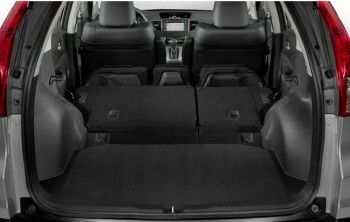 It offers more standard cargo space than the Accord (37.2 cubic feet vs. 15.8 cubic feet), and offers 70.9 cubic feet with the rear seats folded down. Available all-wheel drive will make it better for snow driving, and the CR-V can tow up to 1,500 pounds. The 2014 Honda CR-V and Accord both come with an impressive array of standard features, including a rearview camera, Bluetooth, and a display screen. The only major difference in features is the CR-V can be equipped with a rear entertainment system, which can be useful for long road trips away from the Middletown area. 2014 Honda Accord – The Accord is ideally suited for commuting to work thanks to its higher efficiency, and it offers a positive impression for businessmen. An Accord will be great for families with a couple of children and minimum cargo needs. 2014 Honda CR-V – The CR-V is a car for the active family thanks to its ample cargo space, optional all-wheel drive, and towing capability. A CR-V will be great for long road trips, going camping, or just running errands around town. Whether you’re ready to make the final decision or want some time with both vehicles, come to Middletown Honda. Located near Mechanicstown, at 520 Route 211 E. in Middletown, NY, we have the 2014 Honda lineup in stock and ready to test drive. Contact our Honda sales team to schedule a test drive!